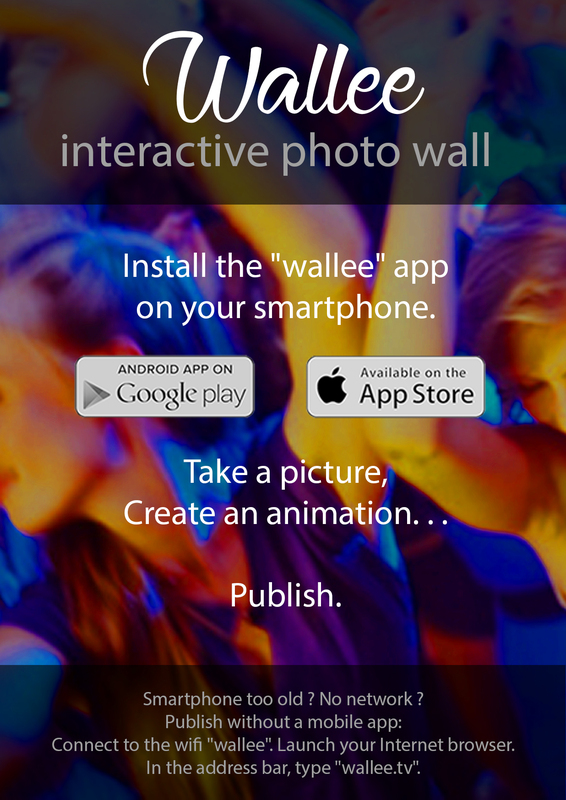 Wallee is an interactive photo wall. During an event, it allows to display in real time the photos taken by the participants with their smartphones as well as by professional photographers and photobooths. With Wallee, no need for Internet connection, the box is autonomous and generates its own Wifi network. The installation is of childish simplicity : a plug, a screen and… a Wallee ! Each participant can send their photos directly to the box via their smartphone. At the end of the event, all photos can be retrieved on a single USB stick. In 54 seconds. . .
No Internet ? No problem. Wallee is totally self-sufficient. Take him everywhere with you. Plug it into a screen or video projector and let the participants do the show. For the public, the box has two photo sharing modes : With or without a mobile application (both modes can be used simultaneously). Participants can download the mobile application ‘Wallee’ for free. 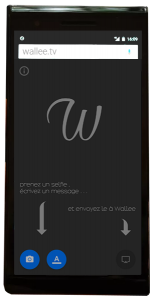 This application allows you to take photos, create animations (animated GIF) or texts and send them directly to Wallee. Without application, participants can connect to the WiFi network ‘Wallee’ and can share their photos by typing the address ‘wallee.tv‘ in their Internet browsers. This mode allows you to use Wallee even in areas where the application cannot be downloaded. Wallee can easily (and free of charge) fit into one or more photobooth. 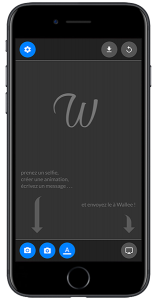 Each photo taken by your devices is then directly displayed on Wallee, as the participants do with their smartphones. We invite you to follow this tutorial to know the technical implementation details. For professional photographers, Wallee is compatible with all wireless Wifi transmitters (*) on the market (Nikon WT-X, Canon WFT-X, CamRanger, etc…) and all Wifi digital SLR (*). All photos taken by your device are then transmitted and displayed in real time on the photo wall. We invite you to follow this tutorial to know the technical implementation details. (*) Transmitters with FTP protocol, photos in JPEG format. 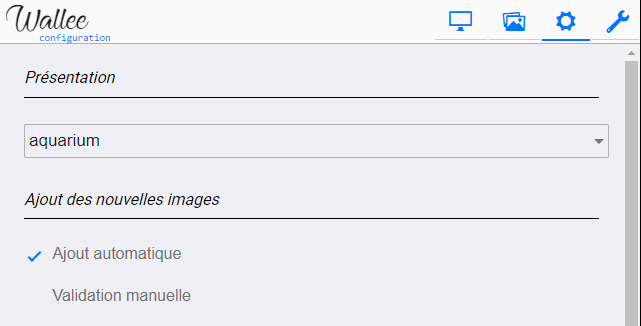 Wallee incorporates several visual themes selectable by the administrator. 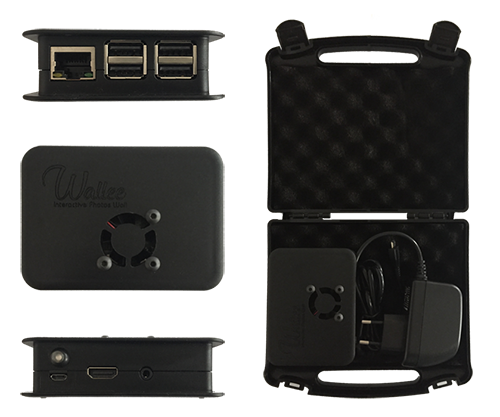 With Wallee-R, the box includes a face detection algorithm. Depending on the chosen theme, each selfie can then be integrated into the current scene for a explosive visual effect ! Showing the last 16 photos. Each new photo replaces the oldest. The wall moves automatically when no picture has been received for some time. Displays the last 8 photos in the form of Polaroids. Each new photo replaces the oldest. Each detected face is integrated into the aquarium. A 1 face selfi in a diver, 2 faces in a couple of divers, etc. The new pictures replace the old ones. Each face is integrated into a cosmonaut. A newcomer projects the oldest in space. Adjustable between 12 and 64 photos. Each photo is pinned to the wall. The new photos replace the older ones. 64 latest photos. Photos are displayed one by one in full screen. Several transition options. 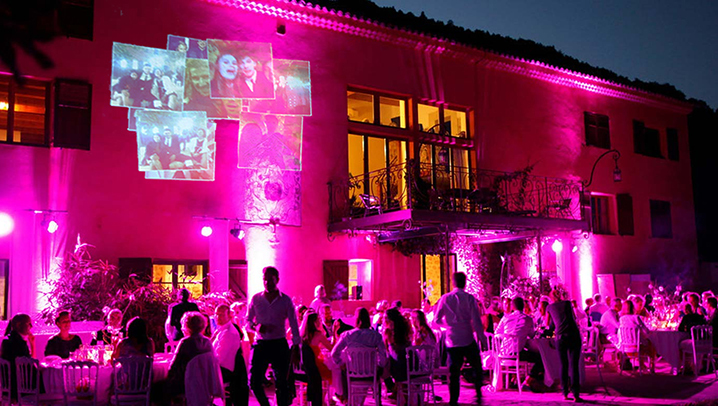 CAMtronic can provide you with additional visual themes, tailor-made for your events. For example, the theme “LOGO” that recreates the logo of your company from photos of participants. For any request, do not hesitate to contact us. Wallee offers a monitoring interface available from any Internet browser (mobile, tablet, laptop). Choose the display theme, the photo moderation mode, a title for your event, a wallpaper and much more… Remove or add a photo of the wall at any time. Finally, insert a simple USB stick into the case to transfer all the photos. Mobility and autonomy. 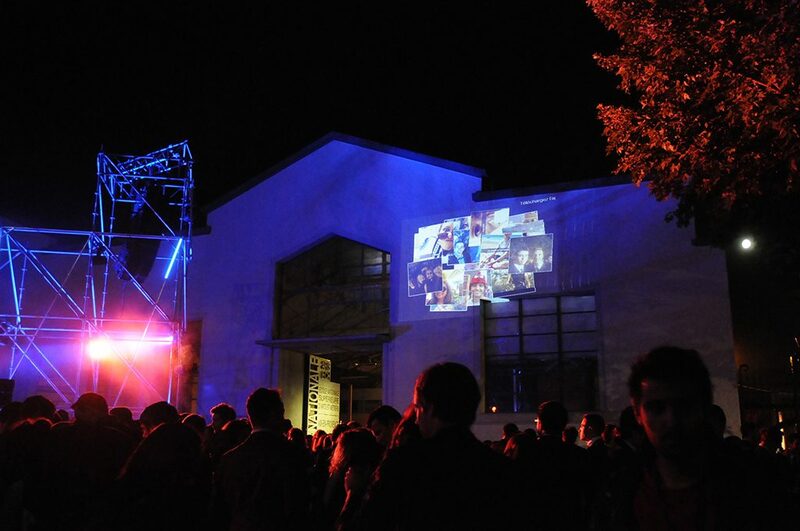 A video projector, a wallee : an interactive photo wall ! You are a photographer, event agency, technical provider : Add Wallee to your benefit list. 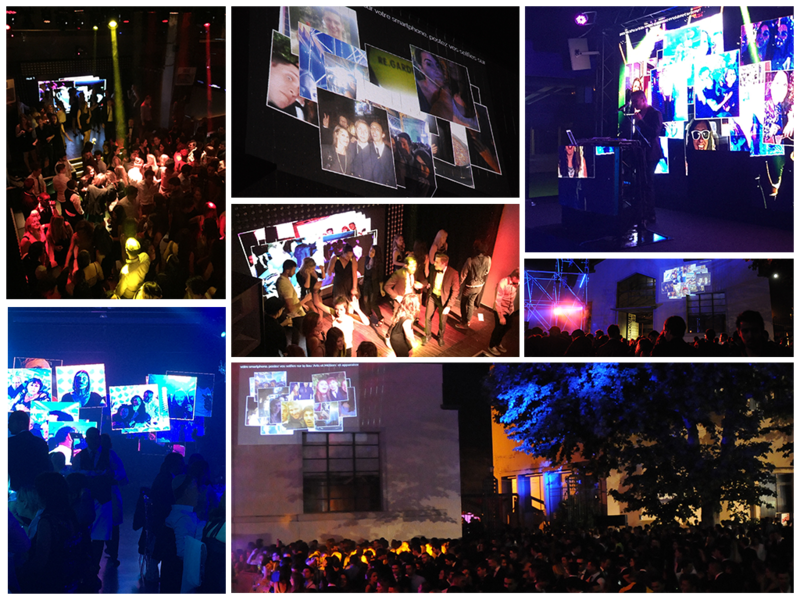 At the end of the event, simply offer a USB stick with all the photos to your customers. Wallee also settles in places. Collect photos from your evenings and spread them on social networks : advertising and attractiveness guaranteed ! Wallee offers a very different approach to the many ‘ social wall ‘ available on the Internet. Here are the main advantages of the box compared to online solutions. – a screen + a Wallee = an interactive photo wall ! – no sending on the Internet, photos remain private to the event. – filter, edit, delete before replaying. Reduced cost : buy and make profitable your Wallee module in a few benefits ! (*) The Wallee mobile app connects to the box only when sending the photo and then disconnects immediately. 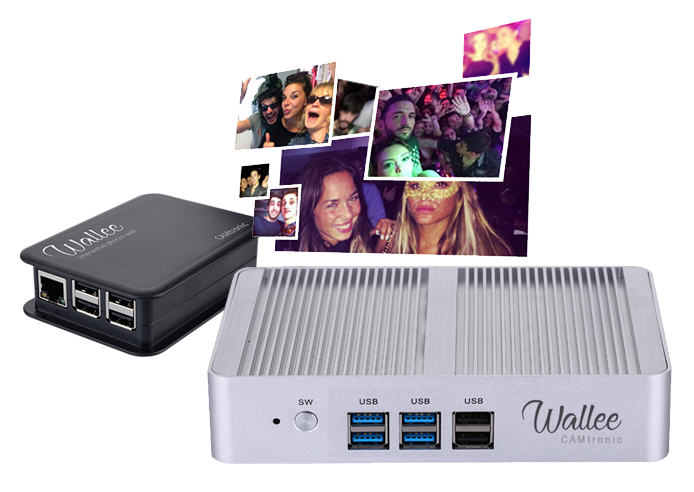 With this sharing system, the Wallee box is able to cover large-scale events. The number of simultaneous Wi-Fi connections is not the maximum number of participants in the event, but rather the number of participants who can post their photos at the same time (seconds ready). 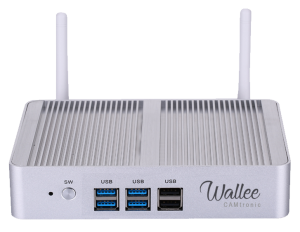 Wallee mini and Wallee-R are two different systems, both software and hardware. 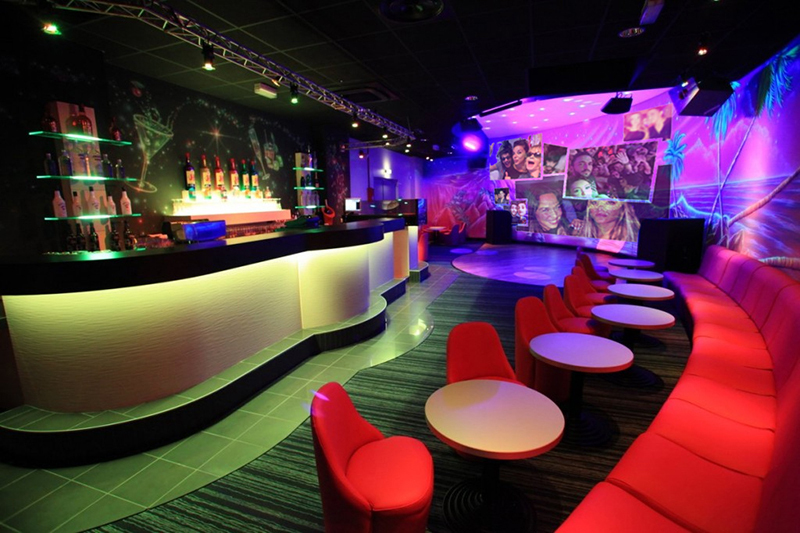 Wallee mini, much simpler, is rather reserved for fixed locations that want to install an ancillary animation (connected to a screen at the entrance of a nightclub for example). Its CPU / memory capacity as well as its small internal Wifi antenna (base raspberry PI) do not allow it to provide live services of scale (too short reach / number of simultaneous connections too low). In summary, if you are responsible for an establishment and want to use Wallee as an additional animation, Wallee mini is for you, in all other cases, we strongly recommend the R model that will meet your expectations in all the situations. Wallee modules are developed and manufactured in France by CAMtronic. They are available for direct sale on Amazon or by request for quotation. Would you like to become a dealer ? Contact us to get our conditions. Demonstrations, online help, training : CAMtronic tutorials are at your disposal. Latest software updates, feedback, follow all the news of CAMtronic modules on social networks. For your participants, you can download the A6 flyer to print or a presentation of the application in the format pptx, ppsx or MP4. Download the Wallee mini user’s manual. Download the Wallee-R user manual.